"The bloodshed of the Third Crusade is vividly portrayed in Pasha's second novel (Mother of All Believers), an excellent swords and sandals saga that takes in the action from an early Islamic perspective. Richard the Lionheart leads the armies of the European Crusaders, while Saladin commands the Muslim forces in Palestine. Both men are cunning and ruthless, and both are victims of the wiles of a beautiful young Jewish woman's plotting--one man as her lover, the other as an enemy. Miriam is the niece of Maimonides, Saladin's trusted physician, and she has the power and will to thwart one man's plans and save the kingdom of the other. This is a suspenseful, action-packed historical filled with intrigue, treachery, revenge, massive atrocity, and gory scenes of battlefield butchery. Best, however, is Pasha's clear depictions of Saladin's and Richard's astute political and military leadership styles as they rally their forces to fight yet another religious war neither would win." "Forget everything you think you know about the Crusades. In this gorgeously wrought tale, Kamran Pasha depicts the other side of the legendary struggle with startling modern relevance. His unexpected vision of charismatic Saladin, tortured Richard the Lionheart, and the proud woman who comes between them is passionate, gilded with detail, and steeped in the blood and thunder of two antagonistic faiths, vying for possession of a beleaguered land. A triumph from start to finish!" "A ripping, action-crammed yarn, Shadow of the Swords puts us smack into the Crusades, making this period new and visceral and riveting. 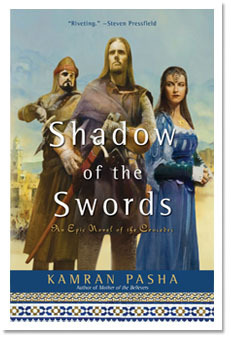 Kamran Pasha is a powerful new voice in historical fiction." "Two outsized legends of the Crusades—Richard the Lionheart and Saladin—face one another once again, this time as mortal men in this intelligent, incisive portrait of the quintessential east-west conflict."